The covering of this story by the British media has been shameful. Readers of this blog know that I have no time for religion, and if there is a religious dimension to this killing, then I have no time for it. No God is a justification for killing. But if it is about ‘an eye for an eye’ and British State’s contempt for people in other countries in which an occupying army is present – as indicated by the perpetrator – then there is something to hear. And we are not hearing it. The BBC, again, leads the charge. The Today programme on 24 May wasted time first on the ‘radicalisation’ debate of young men and then getting muslim religious leaders again to condemn what has happened. And any equivocation is pounced on as tacit endorsement for the act. Wrongly. And now it is reported that one-hundred British imams have signed a letter condemning the Woolwich attack in the name of ‘our’ religion. BBC Newsnight on 23 May interviewed ‘radical cleric’ Anjem Choudary and – not surprisingly – he refused to condemn the killing despite repeated requests by presenter Kirsty Wark. According to the Guardian newspaper “he said he was “shocked” by the murder of Lee Rigby who was killed on Wednesday afternoon but pointedly refused to say he “abhorred” the attack.” What is the point in this kind of questioning? Radio 5 Live employs a gang of inept journalists to cover the ‘latest’ from the story. ‘The streets of Woolwich are eeriely quiet, but one can sense a change in attitude in the last few minutes’ – excuse my paraphrasing of nonsense heard on Wednesday’s blanket coverage. (This particular ‘journalist’ is skilled in this respect. ); David Cameron is cutting short his visit to Paris to chair a meeting of COBRA. 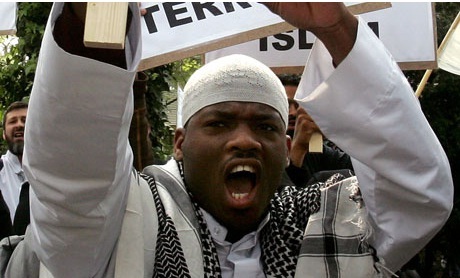 He leads us in condemnation and facing up to the ‘threat’ posed by terrorist s.
The vocal man with the bloodied hands – Michael Adebolajo (right) – makes his case pretty coherently. He uses all of the sources open to him – in this case the ability and willingness of witnesses to use their mobile phones to record the aftermath. It seems clear to me what the motive was; but I have yet to hear a discussion on the grievance and how that translates to killing in the street. I have heard no parallel news stories dealing with the carnage in Iraq and Afghanistan; made all the more surreal with President Obama talking on the same day and almost in the same breath about drone strikes – soldiers in the USA attacking citizens of far-away countries from the safety of a military base on the US mainland. The British public respond with a tacit endorsement of Fascists who are quick to get onto the streets to stir up unrest. They also then give the charity ‘Help for Heroes’ their best fund-raising day since establishment. Politicians and journalists revel in these kinds of stories. There’s capital to be made. Since writing this post, Mehdi Hassan in the New Statesman has written a piece drawing on the link between foreign policy and violence. This piece – which is not available on the New Statesman Website – has elicited a response suggesting that it is half right. Readers of this blog can access this argument here: http://www.newstatesman.com/politics/2013/06/why-mehdi-hasan-half-right-and-half-wrong-foreign-policy-cause-terrorism; It is right to point out that there are many different groupings within Islam and one may not be able argue that violence against Shia muslims in Iraq equates with violent reprisals by Sunni muslims in the UK. When in Brussels, we stayed in the relatively new Park Inn adjacent to Midi station. It was a very comfortable hotel; a bizarre relationship to breakfast – in bed or not at all. But we found better alternatives to a hotel breakfast in the city. Design always intrigues me. Park Inn apparently is a brand (above left). Those colours under the word ‘park’ are critical. So much so that a design/decor firm sold the idea of incorporating them into the internal decor of each room. 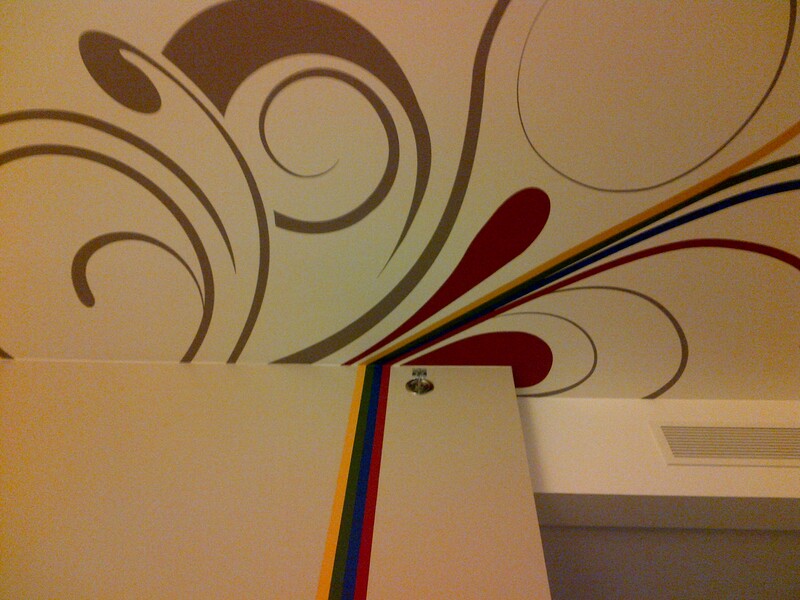 The result is a sticker that goes up the wall like a London Tube map and then blooms on the ceiling. I can assure you this is disconcerting when one first wakes up. I’m not much of a train spotter, but walking towards Brussels Midi on 12 May 2013, I could not help noticing a locomotive (left). I trust it is a Class 204 originating from the 1950s. This is as close as I could get, but it looks impressive and powerful. I note from those who know the following in terms of history: “At the time the TEE (Trans Europe Express) trains were introduced in 1957, the belgian locomotives of the 204 serie (later on 54 serie) have started hauling trains on the Paris-Brussels and Köln-Brussels lines. This is probably were they were given the honorific title of “TEE locomotive”. 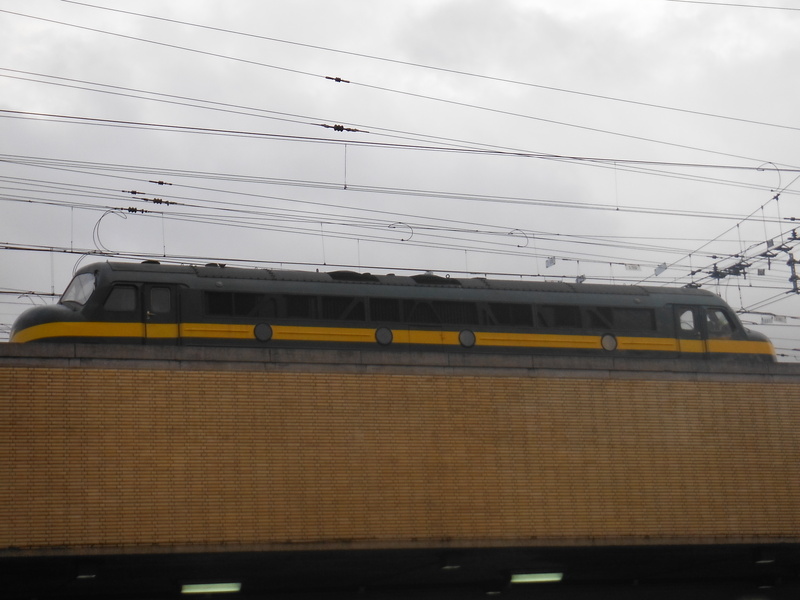 The belgian SNCB had, with these units, the possibility of concurrencing the foreign trains operating on its network. Upon arrival of the multi-current electric locomotives on the TEE lines (in 1963/1964), the 204/54 were assigned to local services, passengers and freight, such as Aachen (SNCB/DB) or Montzen (SNCB/NS). “These units, like the 202 and 203 series (later on 52 and 53 series) were derived from the NOHAB-GM (64.2246) used in Norway. They have been built by AFB (Anglo Franco Belge) at the La Croyère factory (Belgium). 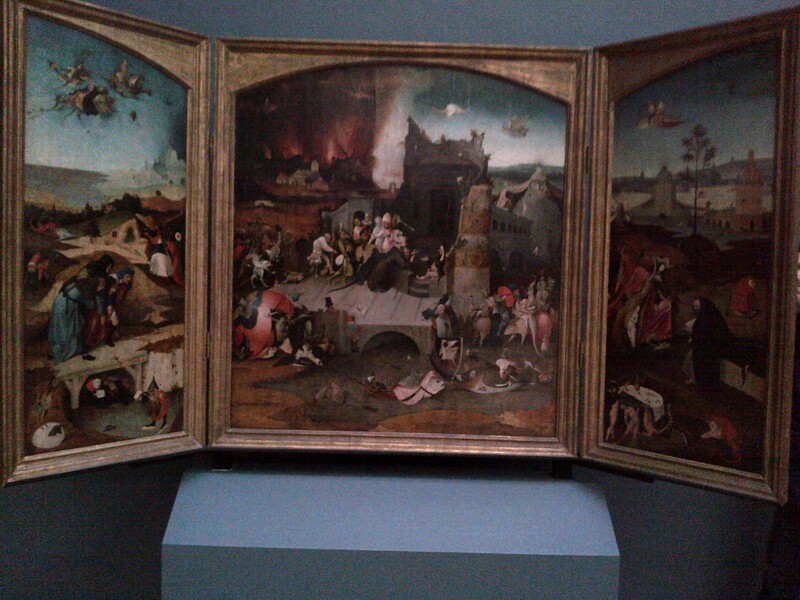 Today’s visit to the Musees Royaux des Beaux-Arts in Brussels uncovered some Low Countries classics. We’d been watching Andrew Graham-Dixon’s recent series on the art of the low countries (see entry 5 April 2013); today’s visit was to trace his footsteps and see some of the work featured in the show, including Pieter Bruegel’s. In particular we were keen to find “La Chute D’Icare”. Suddenly, there it was. Ilonka points here to Icarus falling into the water after his ill-fated flight towards the sun. Other notable pictures include a fantastic copy of Hieronymus Bosch’s triptych, “Triptyque de la tentation de Saint Antoine” (the original can be found in Museu Nacional de Arte Antiga in Lisbon – there are apparently 11 other copies). The picture (right) is difficult to make out from my mobile phone camera in poor light, but the assortment of other-worldly creatures that populate it are worthy of any Terry Gilliam movie or mind under the influence of some narcotic. St Antoine was a rich Egyptian who gave up his worldly possessions to the poor to live as a hermit in the desert. In so doing, he was constantly subject to – largely sexual – temptations from prostitutes, pimps and demons. There are many more pictures that I could upload. 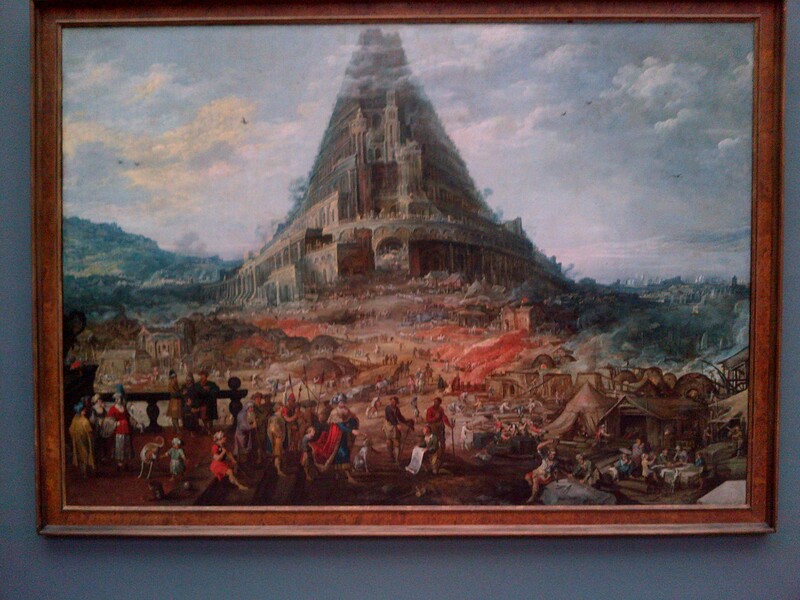 I offer one further gem, Frans Franken II/ Joos de Momper II’s Tower of Babel (1650) (left). Although this is a biblical image, it conjures up for me a very contemporary fixation with height. London has become fixated, for sure. Other recommendations – Frans Hal’s “Portrait de Willem Van Heythuysen” (1650) a classic unmistakable Hals portrait of a rich trader; David Winckboons’ “Le Vendeur de Gumbardes” (1614) (a rather unpleasant dental appointment); Crispiaen van den Broeck’s “Le Judgement Dernier” (1560). T his museum is a delight. It is large but really not crowded. The Rubens room (right) is vast – it has to be to accommodate some of the largest paintings that I have ever seen mounted in a gallery. 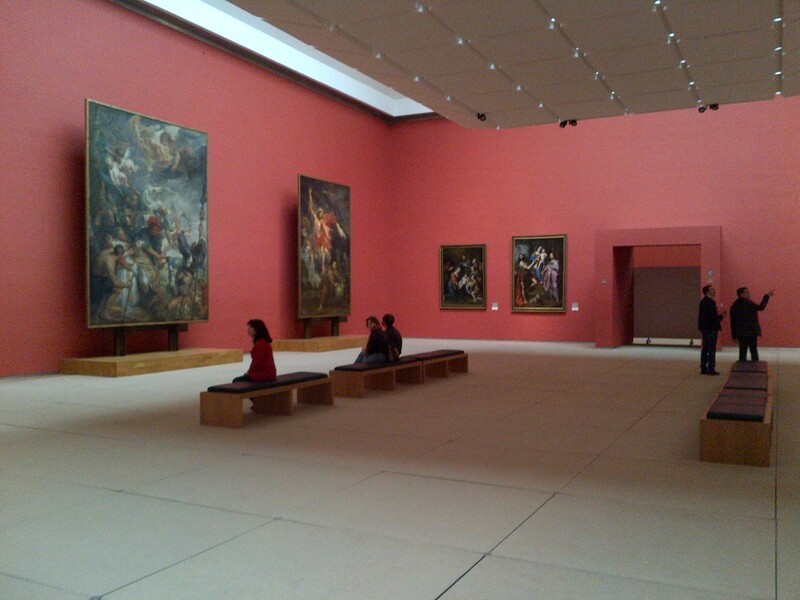 But the gallery of ancient paintings is complemented by the Moderne and the Magritte. Currently the Moderne is being refurbished and is closed. Not to worry, there was enough treasure in the Ancient collection to keep us going for the day. It rained whilst we were in the gallery. I bought an umbrella – unusual for me buying from a gift shop – with the Bruegel painting printed on to it.